Following her appearance at the Build Series, Natasha Lyonne was joined by Chloe Sevigny and Taylor Schilling at the Netflix premiere of 'Russian Doll' yesterday evening(January 23rd) a the Metrograph in New York. 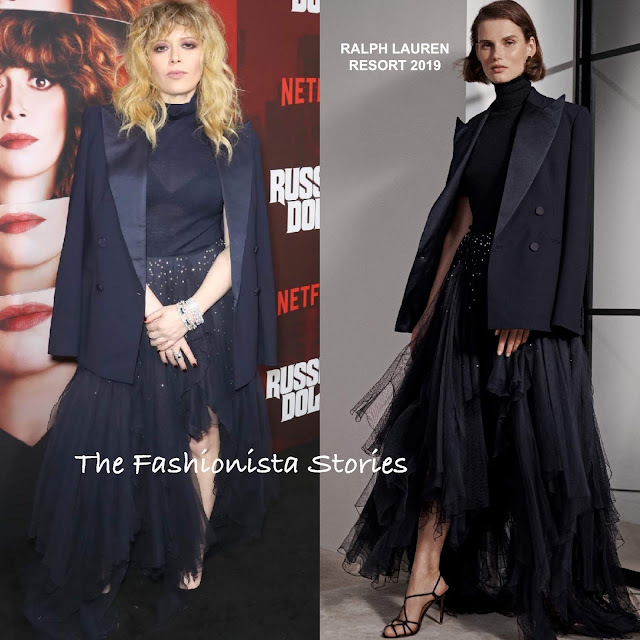 Natasha Lyonne worked a feminine & masculine inspired look from the RALPH LAUREN RESORT 2019 collection which featured a navy blazer, a navy sheer turtleneck and navy tulle asymmetrical skirt which was adorned with gold sequins. Chloe Sevigny was my favorite in this MIU MIU SPRING 2019 black leather top which was belted at the waist & featured a bow waist and black biker shorts. She also wore the black knee socks and carried the black top handle from the runway's look. Her black platform sandals which are also Miu Miu, works with her edgy ensemble but the fuchsia makes it playfully chic. However this is still a winning look which she topped off with a colored lip. Taylor Schilling was on fashion repeat, wearing a custom THAKOON black suit which she wore to the 2016 Golden Globes. For the Globes, she went braless, on this occasion, she wore a BELLA FREUD 'I Love You' tee underneath. I actually prefer the globes styling but she still looks great here.